With the end of Summer in sight it can feel a little bit depressing, somehow it never really feels like we have had much of a Summer, however it does bring up the exciting question of what’s in fashion for the up and coming Autumn/Winter months. With a brand new season on the horizon it’s the perfect time to clear out your wardrobe and think about those wardrobe staples you want to add to your collection. 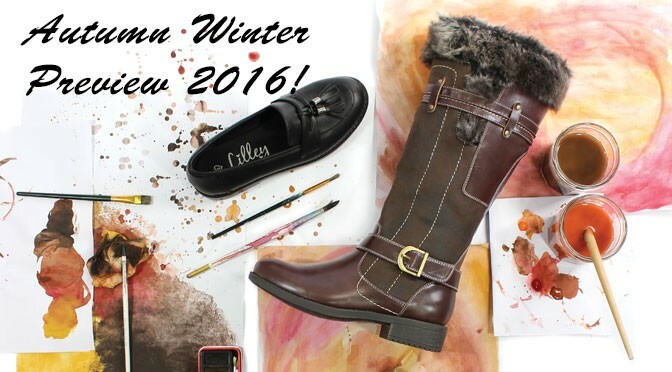 We are really excited to share with you our very own Autumn Winter footwear preview for 2016; we have some truly gorgeous styles coming in that we know you are going to love as much as we do. We’ve also got a few tips of how we plan to style them, to help keep you look bang on trend. 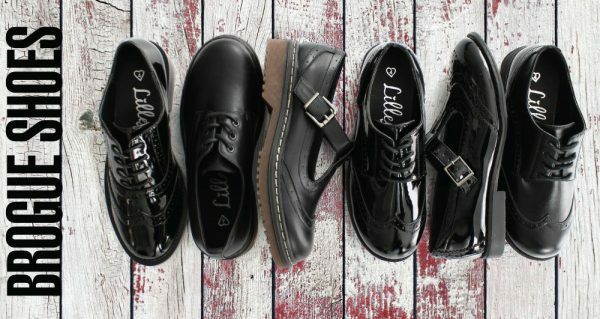 Brogue shoes are one style that never really goes out of fashion and this season we are really excited that we have a bigger and better range to share with you. This season we will be teaming our brogue shoes with frilly ankle socks for an edgy, grungy look that harks back to the cool nineties. Mix things up by choosing different finishes such as patent and matte and pick out different fastenings such as laces and buckles. With all of them featuring that classic brogue detailing this is one style you shouldn’t miss out on, perfect for work or play they really are a wardrobe staple. Loafers are a classic style that has stood the test of time; they are so comfortable it will feel as if you are wearing slippers. 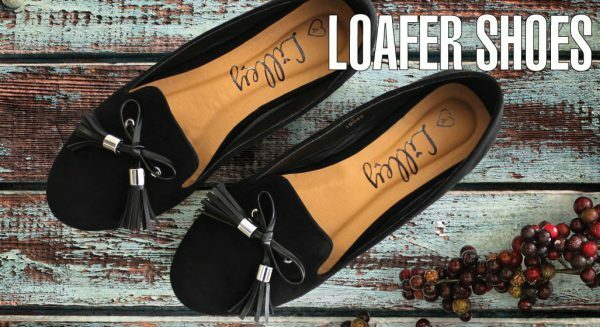 This season our collection of loafers boasts some truly gorgeous designs that include fringing, tassels and horse bits, all details that give them that high fashion twist. Pick a different finish to mix things up; our black or tan suede effect styles add a touch of luxury to your overall outfit. We’ll be styling these with cigarette pants and light pastel knit for a timeless look. This season court shoes are still taking centre stage, however there is a new heel on the block. 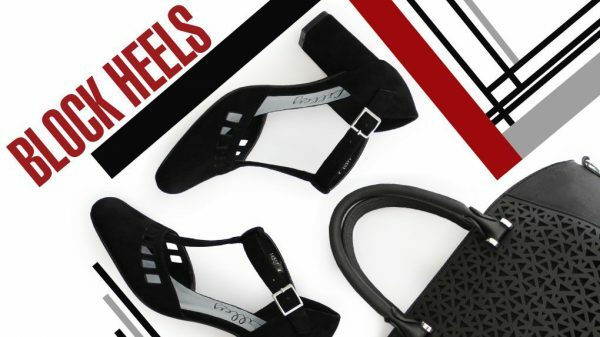 Block heels not only look super stylish but they are also so comfy to wear which means they are perfect for the office or an evening out with friends. Choose a style that features eye-catching detailing such as interesting cut outs and buckles. Style with a block coloured dress and let these shoes do the talking. With a secure, chunky heel you can rest assured you can dance the night away in comfort! Next season brings with it lots of parties and evenings out so make sure your feet are all set with a pair of our super stylish and sparkly party shoes. 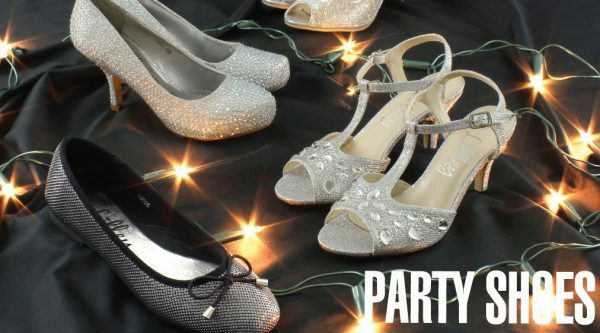 The choice is endless when it comes to our party shoe range and we know you are going to love them as much as we do! Looking for a pair of shoes that ooze glamour? Then pick out a pair of our diamante encrusted platform courts or some sparkly sling back sandals, these look best when styled with your favourite LBD to really make them stand out. Not a heels fan? Fear not, this season we have some gorgeous glitzy ballerinas that will keep you dancing all night. From pretty bows to jewel clusters, they are the perfect party shoes or great for adding a touch of glamour to a grey day. For a cool, edgy look try a pair of wedge ankle boots, these were all over the runway for the next season so why not add a pair to your everyday look. Choose from black, brown, tan or taupe to mix up your look and don’t forget to pick out gorgeous details such as knitted and fur collars, shearling linings and classic buckles. With wedges being one of the most comfortable styles to walk in, you’d be mad to miss out on a pair of these. Team with skinny jeans and cosy knit for a relaxed and warm weekend look. Ah the good old Chelsea boot, it’s such a classic style that we should all have in our wardrobe. Whether you choose black or a more autumnal tan, they will go with any outfit you throw together. Looking to rock a grungy style that you can team with a dress, frilly socks and slouchy cardigan? Then a pair with studs, zips or buckles is for you. Looking to create a more polished look? Then a plain style with a pointed toe will look amazing teamed with skinny jeans, fur coat and berry coloured fedora hat for a retro look that you can wear time and time again. Choose from heeled or flat depending on your mood, and play around with different looks, they are so versatile, you can’t go wrong! A pair of lace up ankle boots can be a lifesaver when the weather gets colder, with a cleated grip sole you can rest assured they will be able to tackle any frosty surface. They are the ultimate casual boot for the colder season and look great with your jeans and thick socks or with a dress for a bit of a grungy look. Choose from different textures such as quilted, suede effect and patent. With many designed with a shearling collar, you’ll be super cosy during those cold days. So whether you’re walking the dog, taking the kids out or just walking to work, these are perfect! There’s nothing better when the Winter comes around than being all snug and cosy, however if you do have to venture out into the cold weather, it will give you a chance to show off these gorgeous long leg boots, these are show stopping boots! With fur lining and fur trims to choose from, you’re guaranteed to keep your legs warm during those cold snaps. With black and brown styles to pick from, you’ll have something to go with every outfit. We’ll be styling these with thick tights and a long sleeved dress for the office or with our jeans for a quiet evening in the pub. 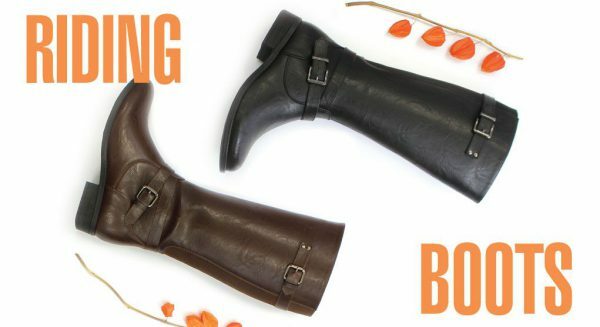 Riding boots are one wardrobe staple all of us should have. They are a classic boot that will go with anything in your wardrobe and with so many designs to choose from, you’ll be spoilt for choice. 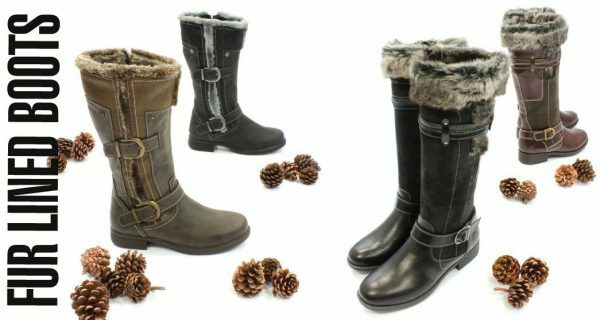 Here at Shoe Zone choose from our black or brown styles that boast some gorgeous detailing such as buckles or zips. Riding boots do tend to be flat, which is good news when it gets a bit slippy on the pavements and also ensures you are comfortable at work. Pair with leggings and oversized cardigan or a dress for after work drinks. They are so versatile; they will fast become your new season favourites. Over the knee boots are a stylish throwback to the bygone eras of the 60s and 70s and this season we have more styles for you to choose from. They will work for a daytime or evening look, so how will you wear them? For a daytime look, choose flat styles that have lace and tassel detailing, style with leggings or a boho print dress for a casual look. For an evening out, pair a heeled style with a tan leather look skirt that screams 70s, don’t forget the floppy hat! This is one trend that just keeps getting better so don’t miss out; anyone can work it with a bit of confidence. You can never have enough handbags right?! Well we certainly don’t think so! So this season we have a stunning collection that you can wear with any look and any outfit. 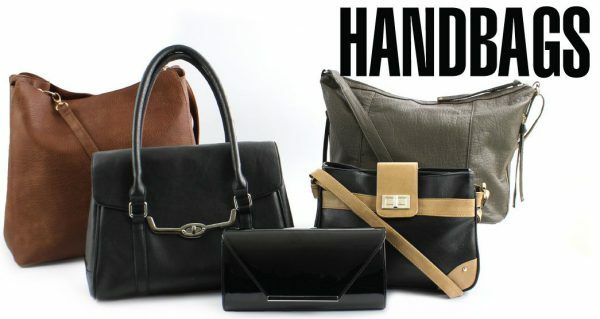 Choose from rich browns, quirky khaki and classic black, the choice is endless. With eye-catching detailing such as tassels and studs you can have a different look for a different day. For a special evening out, choose a classic clutch bag that is perfect for holding those important essentials such as your favourite lipstick, so go on give your look a stunning finish. So, which trends will you be rocking this season? With so many different looks to try, we should be excited about the new season! It’s a time to embrace new colours, new styles and be a bit different! 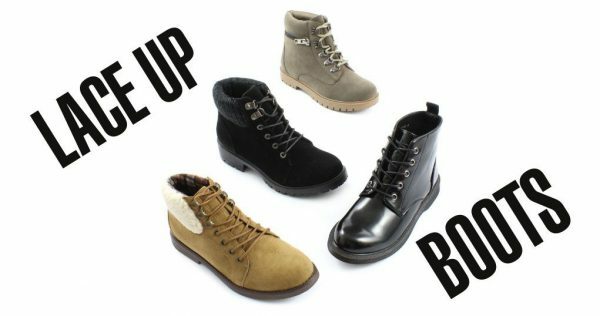 Always remember to invest in a good pair of boots as once the cold weather hits these will be your go to footwear! Mix things up and play around with your look, with so many hot trends you can have a new look every day! Thanks for your comment. All these Autumn/Winter styles will be coming into stores over the coming months as we move into the new season. Douglas is our only Isle of Man store, if there is a style you like do let us know and we can see if it will be stocked in your local branch. If there is anything else we can help with, do email our friendly customer services team at customerservices@shoezone.com.